The Democratic platform is a monument to Bernie Sanders’ campaign. The Democratic platform is a monument to his campaign. 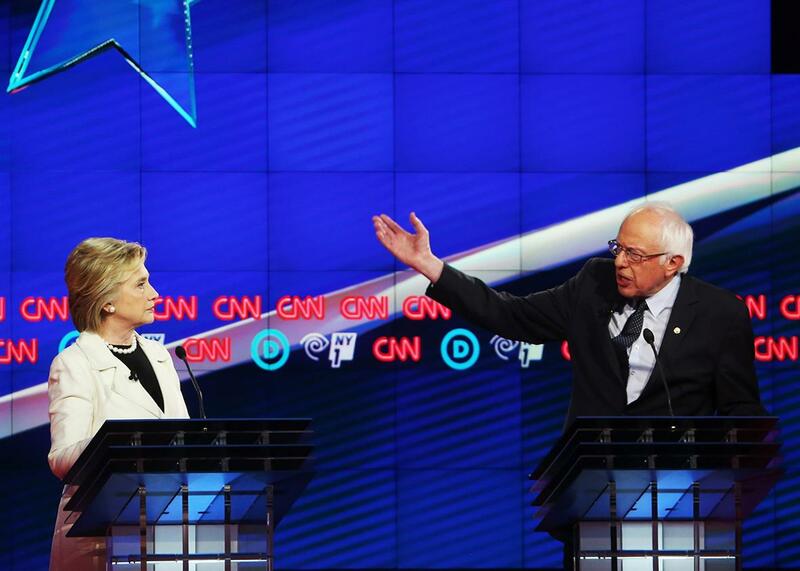 Hillary Clinton and Sen. Bernie Sanders appear at the CNN Democratic Presidential Primary Debate on April 14 in New York City. On Tuesday, Bernie Sanders will join Hillary Clinton in New Hampshire, the state that supercharged his insurgent candidacy and gave him a shot at the nomination. There, according to reports, they will campaign together. After weeks of waiting, the Vermont senator will endorse Clinton as the nominee of the Democratic Party. He’ll do so with his influence, and his leverage, intact. Last month, I wrote that Sanders was losing his leverage—that Clinton’s consolidation of liberal voters and Democratic Party actors had worn down his ability to pull the party to the left. That assessment, rooted in Clinton’s rapid ascent against Donald Trump in national polling, was wrong. Instead, through tight marshaling of his supporters and delegates, Sanders waged a successful fight to produce the most liberal Democratic platform in a generation. The draft platform, produced this weekend at a meeting of Clinton and Sanders delegates in Orlando, Florida, still needs to be ratified at the Democratic National Convention. And there, delegates can make amendments and change provisions. But even with that caveat, this document represents a victory for Sanders and his backers, with planks that reflect the aims of his campaign. What did he win? Included in the new platform is his call for a $15 per hour minimum wage, Social Security expansion, a carbon tax to price its impact on the environment, tough language on Wall Street reform and antitrust, opposition to the death penalty, and a “reasoned pathway for future legalization” of marijuana. That’s not to call this an unqualified success. Clinton delegates blocked a Sanders-favored fracking ban, a “Medicare for all” plank, a call for public financing of elections, an amendment to block lobbyists from serving as regulators (and vice versa), and language that would commit Democrats to pushing “an end to occupation and illegal settlements” in Palestinian territory. On the whole, however, Sanders won more than he lost, especially given the degree to which the two sides were more simpatico than aligned against each other. Indeed, for as much as coverage emphasized discord between Clinton and Sanders delegates, the real story is the extent to which the entire party has moved to the left, with broad agreement on most issues. Team Clinton and Team Sanders moved in tandem on a whole host of concerns, such as a police-reform plank that committed the party against police militarization and racial profiling (as well as supporting the use of body cameras), “postal banking” that expands banking services to low-income Americans, an end to loopholes for estates and hedge funds, and a stronger Earned Income Tax Credit. Even where Sanders lost, he still received something close to his aim. Democrats approved a fracking plank that backed additional regulations from local, state, and federal government, and Clinton herself endorsed a “public option” for the Affordable Care Act, widely seen as a possible step toward a single-payer health care system. When it was all over, both sides were satisfied. “We are proud of the work that Democrats did in Orlando and for coming together to further strengthen the most progressive platform in the history of our party,” said Clinton senior policy adviser Maya Harris on Saturday. “I think if you read the platform right now, you will understand that the political revolution is alive and kicking,” said Sanders policy director Warren Gunnells to NBC News. There’s a big asterisk in all of this: Historically, party platforms haven’t mattered for presidential candidates or presidential campaigns. At best, they are guideposts for future movement. More often than not, they’re irrelevant—unenforceable documents that fall inevitably into the ash bin of history. Even that asterisk, however, requires an asterisk. If platforms don’t matter, it’s in part because party players act as such. But those figures can act differently, and when they do, those documents take on new significance. That Bernie Sanders has emphasized the platform—that Hillary Clinton has followed suit, with involvement from Team Obama—is a strong sign that it matters. And while it might not shape a Clinton White House—whose movement, like all administrations’, is shaped by contingency and opportunity as much as by ideology and strategy—it provides a hook for activists and a basis for further demands. Liberal interests and other groups can measure the Democratic Party’s actions against its stated principles and demand accountability when they fall short. And political innovators within Democratic politics—people like Bernie Sanders, for instance—can use the platform as a starting point for pushing the boundaries of the status quo. If nothing else, this platform emphasizes the extent to which 2016 isn’t a year to move to the center. Barring a dramatic shift in Donald Trump himself, Democrats and Republicans will fight the fall election on questions of identity. What kind of country do we have, and who is it for? It’s an election where policy and ideology play a role but aren’t at center stage. For liberals and progressives, it’s an incredible opportunity to move beyond the Obama administration and its modest steps to the left. Judging from the platform, they’re going to take it.